Located in a propitious position from the city center, Hotel Residence Ulivi e Palme is the perfect starting point to visit the principal Sardinian town. The Hotel–Residence Ulivi e Palme is provided with 127 rooms with bathroom, TV, direct dials telephones, central heating and air conditioning. 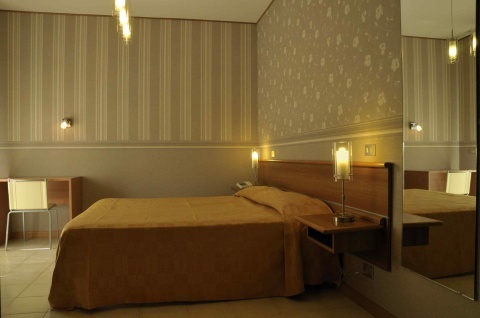 The Ulivi e Palme Hotel consists of 22 rooms with fridge, without kitchenette. We offer B&B (Bed and Breakfast) and also HB (half board) at our Restaurant (located in fourth floor). FB (full board) only for groups. The Ulivi e Palme Residence consists of 100 flats: one-roomed flats or two-roomed flats equipped with furnished kitchenette. It also includes electricity and water use, kitchenette, cleaning and linen change. Breakfast is not included. We offer special rates for long periods. The Hotel Residence "Ulivi e Palme" is provided with two Conference Rooms with modern audiovisual support. We arrange coffe break services and brunch. On the fourth floor, beautifully sited with a panoramic view of the Lagoon of Molentargius, the Restaurant offers excellent traditional cusine in a friendly and warm environment. You are welcome to join the "Sporting club Ulivi e Palme" with Gym, Body Building and Dance rooms. The management of the Sporting Club offers special prices for our guests. You can attend swimming courses for adult and childrens, water-gym, body building and water-aerobics.The swimming pool is closed every year from the 26th of july to the 31th of August and every sunday. The Hotel Residence is also equipped with two tennis court, free for you.